If Lauren Sanchez is upset by recent reports from friends that she bragged about dating the world's richest man, she isn't showing it. 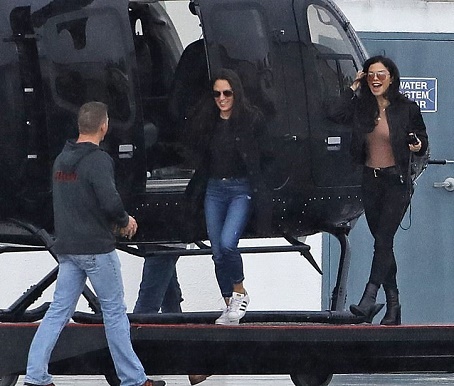 Jeff Bezos' pilot lover was all smiles after she successfully landed her helicopter at Santa Monica Airport on Monday. The California weather was uncharacteristically dreary but Sanchez, 49, beamed as she gave her female companion a high-five after the smooth landing. 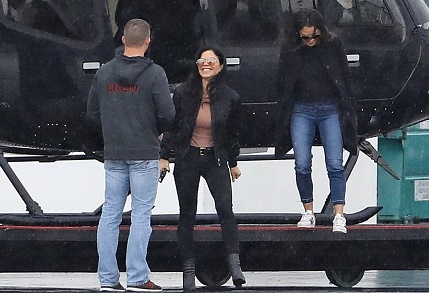 Sanchez, who runs her own aerial film production company, ignored the light sprinkling of rain as she examined the chopper before heading inside. And she was dressed to impress for a day in the sky, adding five-inch ankle boots to spice up her outfit of black jeans, a black bomber jacket, and a peach shirt. Sanchez was spotted just hours after a longtime friend claimed that the married TV anchor set her sights on Bezos after she and her Hollywood agent husband became friends with the billionaire in Seattle. After meeting the Amazon CEO and his wife MacKenzie socially several years ago, Sanchez told a friend, 'Now that's the kind of guy I need,' a close friend claimed to DailyMail.com, convinced she was referring to Bezos's wealth. Sanchez, who was revealed to be romantically involved with the billionaire shortly after he announced he was divorcing his wife of 25 years on Wednesday, has a penchant for 'living large,' the insider added. In fact, during a shopping trip with girl friends to high-end department stores Neiman Marcus and Barney's in Beverly Hills, Sanchez took home a $12,000 designer shoe haul. According to the friend, Sanchez is 'very sweet but she was always a climber'. Sanchez is a third-generation Mexican-American who was born in Albuquerque, New Mexico where she had a modest upbringing. What will happened to her marriage now? Which marriage again? 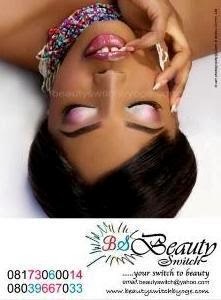 Is her "husband" going to allow her to date another man under his roof?